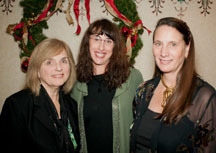 AWC-Santa Barbara started off A BRAND New Year at our annual holiday party on December 7, recognizing the Women’s Fund as the 2011 Nonprofit of the Year and naming Cindy Faith Swain, owner of PlanABrand, as Member of the Year. 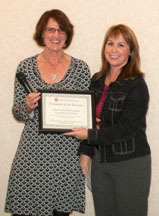 Swain, whose company is a full-service branding, marketing and social media company, was honored for her contributions to advance the goals of AWC-SB and her leadership in the field of communications. “I’m honored to accept this award,” said Swain who has more than 20 years of worldwide licensing and business development experience, including 12 years with Warner Bros. She gave a short but informative talk on the benefits of branding your business, plus an entertaining look at some of the more successful brands out there. For more tips, visit her Facebook page, and follow her on Twitter. Women’s Fund member Judy Marline accepted the award for the nonprofit, remarking, “Not only does the Women’s Fund of Northern Santa Barbara county respond to the community’s most urgent needs through substantial grants, but it also educates and inspires women to become leaders in philanthropy.” Women’s Fund members pool their own money and donate their time to make a difference through collective philanthropy. With the support of the Santa Barbara Foundation, the Orfalea Foundations and the Roy and Ida Eagle Foundation, the Women’s Fund has awarded nearly $500,000 to 20 nonprofits over four years. This entry was posted in Past Events on December 31, 2011 by Lisa.